■ Suitable for intelligent production of small-batch and various-type construction machinery products with large-size jobs and high-quality requirements, including intelligent cutting line, intelligent welding line, intelligent machining line, intelligent assembly line, intelligent painting line and intelligent transporting line etc. ■ Suitable for production processes of various products. Some non-standard intelligent equipment are designed and combined with each other, thus achieving balanced production which can switch rapidly from one model to another. 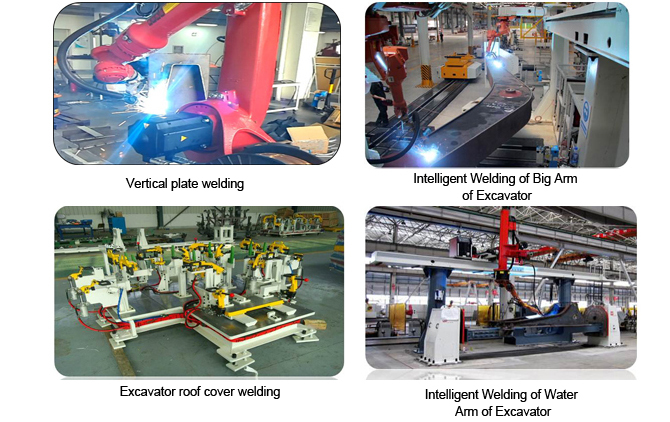 The production line has effectively solved the problems existing in the cutting, welding and carrying of large-scale structural components which are moderate in thickness, improved the production efficiency and product quality. ■ Module design is achieved on the non-standard structure of the whole production line, hence it is convenient to conduct rapid maintenance and part replacement. 4. Unique dust removing equipment is adopted, making the entire factory more environment-friendly and clean.